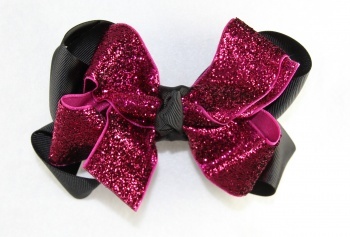 Hot Pink Shimmering Sparkles Bow that is layered on top of a larger black bow. What a great combination of pink and black. Both layers are 1.5" wide ribbons. The black is grosgrain ribbon and it also wraps the center. The pink shimmering bow has sparkles all over, WOW!